We aren't sure what hit us, but we sure are glad to have Rowan Maness sit down to help us navigate her latest novel, BOMBSHELL. Rowan, what scene was really hard for you to write and why, and is that the one of which you are most proud? Or is there another scene you particularly love? I'm most proud of the scene at Papago Park, when Joss meets James, a man she has been chatting with online and fallen in some kind of love with. It was fun to write, and wound up kind of breaking my heart. The fallout of that scene and Joss' walk through a hallucinatory version of the desert is probably my favorite part of the book. How long did you work on BOMBSHELL? Bombshell took me a year to write, and Simon & Schuster bought it way back in 2014. I'm married to a screenwriter, and I thought Hollywood moved slowly, but the literary world is even slower. What do you hope readers will take away from BOMBSHELL? I hope that someone out there will feel warmly towards Joss, despite her many flaws, and maybe even see themselves in her. I'd love for readers to think about what lies they are telling themselves and other people, and what those lies reveal about their true selves. I work at home, usually during my younger daughter's first nap of the day. Though frustrating, following a child's nap schedule winds up making me more productive in the end, since I know my time is limited and am therefore less likely to stare out the window for half an hour or scroll through Instagram until my brain hurts. I make play lists and vision boards for all my projects, and when I was writing Bombshell certain songs were really important for getting me in the zone. I'd listen to them, turn the music off, and start writing. Once I get started, silence and snacks are my two necessities. I am in the very beginning stages of a new, non-YA novel, and am working on developing Bombshell as a TV series. Rowan Maness was born and raised in the desert, on the edges of the vast Phoenix, Arizona ‘burbs. She earned her first paycheck in high school, when she won a writing contest with an essay about the importance of honesty – at the same time she was busy creating multiple fake personalities online. One of those fake personalities met the man who would eventually become Rowan’s husband, and she moved to Los Angeles to be with him and attend art school. In 2009, the day before she gave birth to her daughter, Rowan graduated from CalArts despite not being able to paint, act, dance, animate or schmooze. Valentine Bell: the golden Year is her first published work. 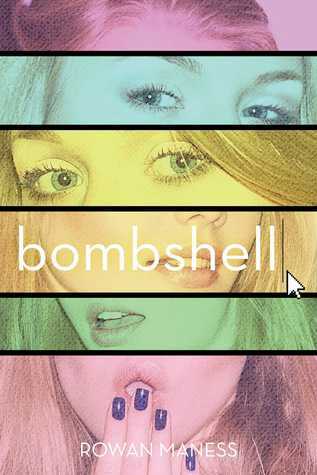 Have you had a chance to read BOMBSHELL yet? Did this novel allow you to reflect on the lies you hear and share? What is your trick for not getting distracted while writing? Share your thoughts about the interview in the comments!